This one was by invite. The venue was Digitalab in Ouseburn, Newcastle-Upon-Tyne. The weather today has been awful so I was quite glad to sit this one out and let my friend take on the driving duties in treacherous conditions, it has to be said. Mind you, travelling in a Nissan Murano along the A1(M) seems like a safe bet in even the worst of conditions, but when you're not paying attention to the Sat-Nav, you're asking for bother. Yak yak yak. We got there in the end though. Digitalab is situated on Stepney Bank, Ouseburn. They specialise in the production and finishing of highest quality photographic printing. 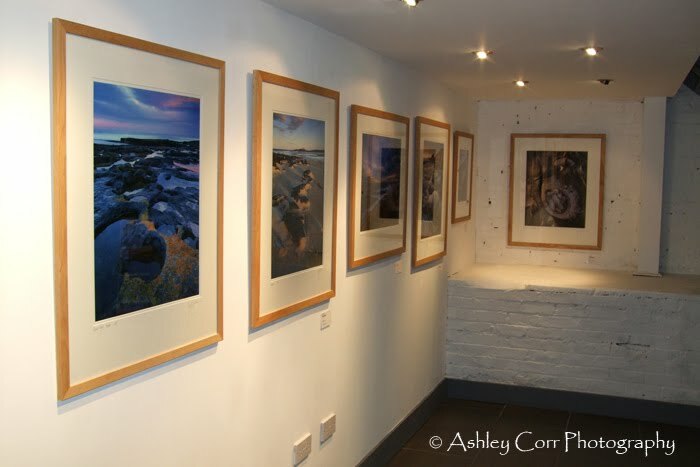 On the premises is a small gallery, which is where the stunning landscape photography of Joe Cornish was being displayed today. Joe was born in Exeter in 1958. He studied art at Reading University, where he first came under the spell of photography. After graduating in 1980, two years assisting in Washington DC and two years assisting studio and car photographers in London prepared him for a career in mainstream commercial photography. It never happened. His passion for the outdoors encouraged him first to pursue travel work. A meeting with Charlie Waite in 1986 helped provide both an important and ongoing source of inspiration, friendship and mutual cooperation. From 1986 to 1995 Joe was responsible for either all or the majority of the photography in more than thirty travel books. An assignment with Raleigh International in 1991 was to inspire an abiding love of wild places and wilderness, and ultimately to alter the direction of his work. Around the same time he began a working relationship with the National Trust photolibrary that continues to this day, and this experience has convinced him of the vital role photography plays in inspiring environmental conservation. Joe knew that his first photographic hero, Ansel Adams, had built his reputation as a landscape photographer by working in Yosemite Valley as a warden for eight years. If London had been a necessary phase in his photographic apprenticeship, it was never going to provide the backdrop for practising the skills needed for landscape. Moving to North Yorkshire in 1993 was a vital first step to fulfilling this goal. Towards the end of 1995, after a frustrating assignment doing travel photography in Greece he made the decision to devote his photography to landscape in general, and wild places in particular. He began this process shooting on the Horseman SW 612 wide-angle camera, but after a year switched completely to 5x4 inch. He has been using various versions of the 5x4 Ebony field camera ever since. The North York Moors and coast are Joe's personal Yosemite, and other outstanding landscapes of northern England have been a further source of inspiration not too far away. 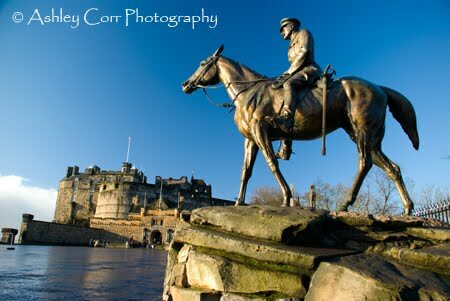 He also has a deep affinity for Scotland's magnificent coast and mountains, and has travelled widely throughout the UK for the National Trust, specialising in particular on the coastline. He believes he must have seen as much of the British coast from the land, as anyone else alive. Joe has continued to be involved in books, having contributed heavily to many National Trust publications, especially Coast and Countryside, published in 1996. His first book as an author was First Light, a Landscape Photographers Art, 2002, now in its fifth printing. More recently he wrote and photographed Scotland's Coast, a Photographer's Journey, and shot the pictures for Urbino, (a hill town in central Italy) a rare departure into architectural photography. He writes regularly for Outdoor Photography and Amateur Photographer magazines, and his work has been featured in (American) Outdoor Photographer magazine. In January 2006 Amateur Photographer honoured him with their annual Power of Photography award. In 1999 Joe started Joegraphic, with designers Joni and Joe Essex, a business devoted to producing a range of cards and calendars. This has since grown and is now developing into Joe Cornish Galleries as a trademark. It includes the production of limited edition prints, two galleries, and embraces a publishing programme that also features the work of other fine photographers. Joe has given lectures on landscape photography throughout the UK and as far afield as New Zealand. He is an experienced workshop leader, having led tours for Charlie Waite's company, Light and Land for a decade, and also for Inversnaid photography workshops. Photographic companies who work with Joe include Lee Filters, Fujifilm UK, Gitzo and Lowepro. 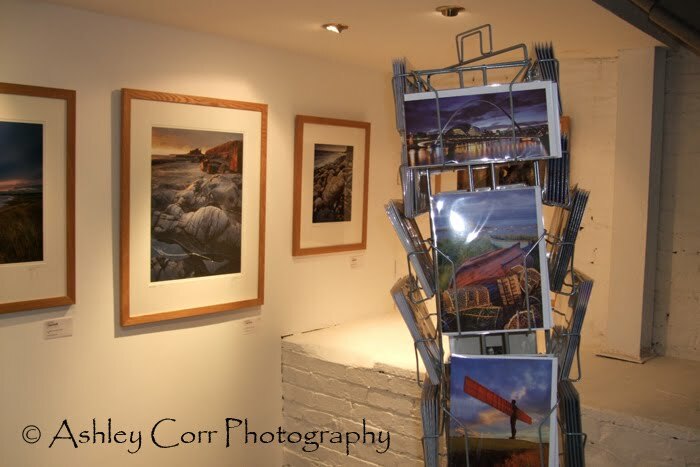 Todays exhibition was a preview for the main event, 'An Evening With Joe Cornish' which takes place on Tuesday 1st December. Work commitments scuppered any chance of me attending the event and meeting Joe in person, so today's preview was the nearest I was going to get to see the man's work up close for the first time. There wasn't a great deal of exhibits, but what was on display was of the highest quality in every photographic sense. Each image was mounted and framed before being signed by the artist and then promptly priced between £400-£500.00 each! Quite steep you may suggest, but anyone who knows their photographic onions would agree that imagery of such a high standard as this deserves to command such a fee. Each image had been printed 'In house' using the latest high-end large format printing equipment. As the images were of local interest I could relate to them quite easily, as I'd often walked these locations before, unknowingly re-tracing the steps of Joe Cornish. There were images of Holy Island, Budle Bay, Dunstanburgh Castle and St Mary's Lighthouse. At a quick turn there were postcards of Newcastle Quayside, Angel Of The North and Roseberry Topping. Each one was breathtaking and the bar was most definately set for any photographer wishing to reach the standard Joe Cornish has set. My friend introduced me to Jill Roe, exhibitions manager at Digitalab. The three of us had a chat about Joe's work and she said how excited she was about the forthcoming event where visitors could meet Joe in person. I told Jill of my own interest in photography and printing techniques before she gave us a tour of the printing studio upstairs. This was a very modern 'State of the art' set-up. I have a large A3+ inkjet myself, but some of these big boys made mine look like an Oxo cube in comparison. Then again, when you're shelling out £175,000 for a printer you obviously mean business. We were shown a large collection of top quality prints in finest detail on a variety of media, including photo papers, canvas wraps and fujiflex. In the meantime, why not take a look at the work of Joe Cornish - a genius in his field. Finally, a link to Digitalab. 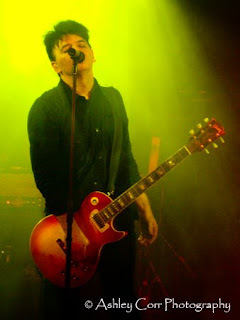 What a nice surprise - Gary Numan playing a live show in Sunderland instead of Newcastle. The venue was the Campus Academy, and this was the north-east leg of the 'Pleasure Principle' tour. Gary had already successfully toured his 1980 album 'Telekon' so it seemed a natural choice to get back on the road and play the 'PP' album in a similar fashion. It's been 30 years since the release of that album so I was interested in how it would be performed after all this time. Would it be played live as it was back in the day, or would Gary opt for a contemporary 'Beefed Up' rendition? On arrival at the venue we were met by a very long queue at the door. I wasn't expecting that! Still 15 minutes before the doors open too. My compact camera was tucked away but the likelihood of getting a good spot near the front looked...well...unlikely. It wasn't long before we were out of the cold and indoors, and I must say the concert room was bigger than I had first anticipated. The walls were covered with American style memorabilia and although the stage looked a bit cramped with all that gear, I was still expecting a great show once the music kicked in. The support act 'Dirty Harry' were quite good. Loud, proud and very much live. A quick changeover and the main event started around 9pm. Numan's band quickly got into their stride, kicking off with the 'Pleasure Principle album and a couple of extra songs from that period. I'm not sure why there were 4 keyboard players though, one of which was Gary himself. The music was excellent, just as I had hoped it would be. The synths were as powerful as always and on reflection it was quite hard to believe that these songs were actually written 30 years ago! Well, I managed to grab a few shots, but being a few rows back hindered my chances of pulling in some big ones, plus the lighting was quite poor for 'Point And Shoot' photography. 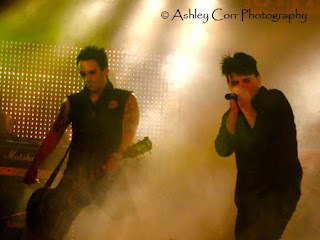 After Gary and the band had played the 'PP' album in its entireity the mood quickly changed as the more recent darker songs were introduced. Not really my cuppa tea to be honest folks, but quite a few of the punters were well into it. Towrds the end of the show we got 'Down In The Park', 'Are Friends Electric' and 'We Are So Fragile' before the final track 'A Prayer For The Unborn'. A great way to finish the night. This was probably the best Numan gig I'd been to and it was great to hear the live versions of an album which was the first one I ever bought back in '79. Showing me age now, eh! It's was back up the A1 motorway again and my fourth visit to Edinburgh of 2009. This time it was a one night stopover on the way to Livingston, a town approximately thirteen and a half miles south-west of Edinburgh. The rain scuppered any chance of me grabbing some early evening low-light shots of the illuminated castle, which was top of my photography wish-list during our brief stopover. Infact, I didn't manage any photography at all on Sunday night and it wasn't too long before we were back in our hotel on the City's High Street. 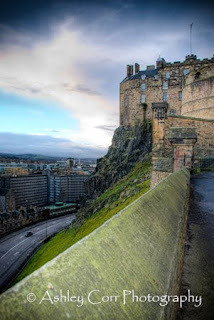 The following morning I awoke early and headed up the Royal Mile towards Edinburgh Castle. The sun had just risen and it quickly disappeared behind the low cloud cover on the horizon. 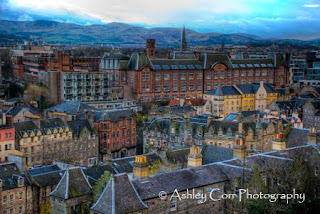 At this time I was in the castle car park overlooking the rooftops towards the west. It's a spectacular view alright, with the hills in the distance and some of the finest architecture in the foreground. It was very chilly, which was to be expected at this time of year, and particularly at such a high vantage point. But no visit to Edinburgh would be complete without a visit to the castle so the customary 'Showing of the face' happened once again. It was a pity that the weather last night got in the way of what was potentially a perfect opportunity to get the shots I was after. Oh well, maybe next time. At mid-day we headed out of the City and back onto the A1, homeward bound. With the belly rumbling once again it was a case of a quick detour into Eyemouth to sample another helping of delicious haggis & chips. This was the third haggis I'd pouched in the space of 24 hours! Dear me, I must go sit in the corner and have a quiet word with ones self (wink). All in all, an enjoyable visit to both Edinburgh and Livingston. Following my attendance at last years light show in the centre of Durham City, I was looking forward to another spectacular in the shape of 'Lumiere'. It was at the same point in 2008 that 'Enlightenment' had taken place so it was time to see whether the 2009 offerings would eclipse that one. As in 2008, the event wasn't advertised very well and I only found out about it through a work colleague. Nevertheless, it was almost here and the batteries were fully charged as I had every intention of attending each of the four nights. Well, that didn't go to plan, as the strong winds and rain on the very first night kept me indoors. Never mind, there's always tomorrow. Friday came around quick enough and I headed for Durham City straight from a days work on the busy production line at Nissan. I arrived at Durham Cathedral around 3.50pm and the area, including Palace Green, was very quiet. A few of the event staff were making final preparations in the build-up to the second night of the light show, with large projection equipment getting a final inspection before play time. 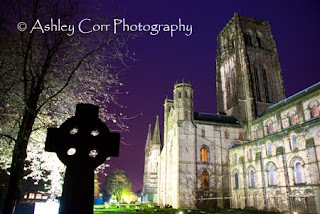 I waited for the deep blue hue in the sky before taking my first shots of the night, in the grounds of Durham Cathedral. This particular light show, CROWN OF LIGHT, was quite spectacular, especially the images that were projected onto the Cathedral itself. They were almost surreal, but eerie at the same time. As the images were projected, the Cathedral bells chimed, with a few seconds between each chime. Yes, it had the desired effect. Quite spooky! After spending most of my first night in the vacinity of the cathedral I decided to cover different parts of the 'Lumiere' trail on my second night, Saturday 14th November. This time I was down on the banks of the River Wear and what a lovely view it was. 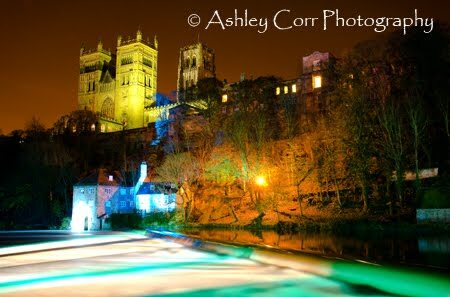 From a vantage point on the riverside, opposite Durham Cathedral, I was greeted by an array of colours that were being projected across the water by strong laser beams. At this point the lights which were illuminating the cathedral itself had been switched off, making photography a big ask when struggling to focus on the focal point itself. The light across the water was very bright, yet across the top of the frame, where I wanted it most, it was almost non-existant. Auto focus wasn't playing so it was manual all the way to get what I wanted. I got there eventually! After bagging a few more shots I headed back along the riverside towards the nearby Prebends Bridge. It was here that I set up stall, on some steps at the waters edge. 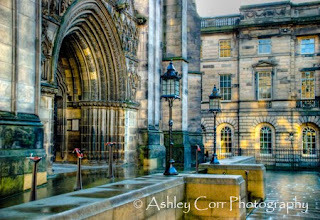 This location is where you get a great view of the Cathedral and it's often the position many photographers take up to grab those picture postcard images. I spent a good 20 minutes here, pulling in some nice shots as the pinky-purple colours were at their most prominent in the sky. Time was pushing on so I quickly made my way across Prebends Bridge and up the incline towards the Cathedral and Palace Green. A quick detour took me through the Cathedral grounds, passing NINE MEN DRAWING along the way. Next stop was the Cloisters, one of my favourite parts of Durham Cathedral. It was here that the 'Lumiere' trail presented visitors with DUNE, an eerie interactive work that whispers and lights up as you walk through it. My last port of call tonight was WINTER GARDEN, a collection of tropical flowers which bloom in winter from beneath Elvet Bridge. Well, not flowers as such, but long flourescent tubes in a variety of colours - quite eye-catching too. Mind you, I nearly didn't make it. After leaving the Cloisters and making my way through Durham Cathedral I was met by the sight of thousands of people at the front, watching the light show from Palace Green. The queue to gain access to the Cathedral was unreal. Some folk obviously don't mind waiting, and waiting, and waiting! The wait was all down to CHORUS, huge pendulums that mesmerise the viewer with light and sound. Well, that was that...my second night on the 'Lumiere' trail had reached its end. Time to head home and put the owld feet up, whilst guzzling a lager or two. 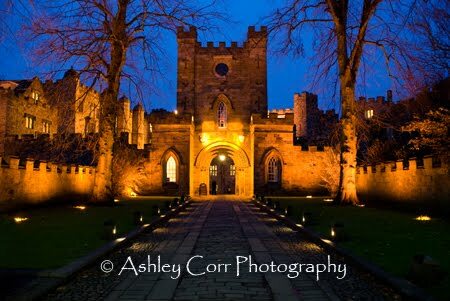 The following night, Sunday 15th November, was the last night of 'Lumiere'. Although I hadn't visited all of the artworks, there was only one or two of the main players that I hadn't recorded and it was time to put that right. My weekend parking ticket got me started once again on the banks of the River Wear, this time at Framwellgate Bridge where I photographed STARRY NIGHTS and FLUX after a brief visit to the Market Place. It was here where a living portrait of the city was projected onto its buildings. This diplay was known as A PLACE FOR FOR THE PEOPLE. Moving on once again...the view along the waters edge near Framwellgate Bridge was one of the best of the whole trail, taking in Durham Castle, Durham Cathedral and the bustling Framwellgate Bridge in the foreground. 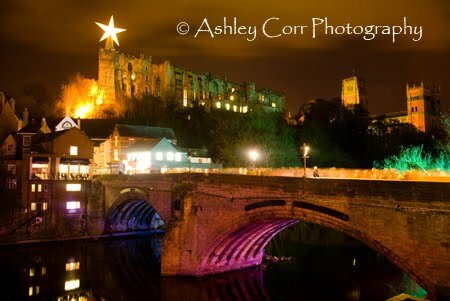 A huge inflatable star was perched high on the castle parapet, which finished off my shots with that little something extra. Mind you, I set my kit up next to the 'InShanghai' chinese buffet and I was beginning to wish I hadn't. Oh dear, the smell was making me very hungry. A quick peep in the window didn't help. Seeing the huge selection of food with steam rising from it only added to my hunger. I was beginning to get sidetracked folks! Aye, me belly was telling me to pack me gear up and get me'sel in there but I held off, against all the odds. I fired off a dozen or so frames as the light show started on Framwellgate Bridge. Glancing over to my right I noticed a rather portly chap tucking into a large plate of barbeque spare ribs in the restaurant. I remember thinking to myself 'The lucky beggar', as I chewed on my Wrigley's Extra that had as much taste as a bloody ice cube! I felt like walking over to the window where he ate to press my face against it...he he he...but thought against it in the end. My thoughts of envy, as he tucked into another fat rib, quickly turned to frustration as I thought to myself... 'Ere pal, I hope you choke on the bloody thing' !!!! (Only jokin' folks...ahem...). Well, that was the end of 'Lumiere' for me. Back to the car and off home. It was nice to get more event coverage under my belt in the form of low-light photography. The conditions are always a challenge but the results can quite often be very spectacular!